Blu-ray Stocking Stuffers from Primal Rights! Thread: Blu-ray Stocking Stuffers from Primal Rights! 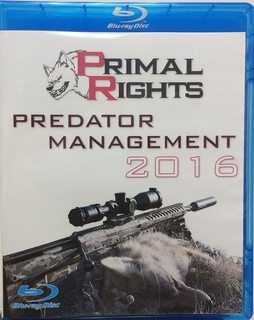 Primal Rights has begun in-house Blu-ray production! We've got some big things planned for 2017, and we needed a great project to get all the kinks worked out of our Blu-ray production and manufacturing process. What better to do that than a coyote hunting video!?!?! These will make fantastic stocking stuffers this Christmas! They are in stock and ready to ship! Christmas is the time for giving, and we are going to dig deep this year just as we do every year. Use coupon code CHRISTMAS during checkout and you'll receive a massive discount on your blu-ray purchases until December 21st. Buy as many as you want and you'll receive the discount for each! Those of you that follow our youtube channel religiously may have seen much of the content on this blu-ray disc before. However, there is some exclusive content as well. No doubt many of your friends and family have not seen any of it! This Blu-ray is just a small taste of things to come from Primal Rights in 2017. Lets close out 2016 together as we sit around with full bellies on Christmas with friends and family watching some fur hit the ground! Last edited by Orkan; 12-04-2016 at 09:50 PM. I ordered one and look forward to it! By Orkan in forum Misc. Primal Rights, Inc is a Supporting Vendor!